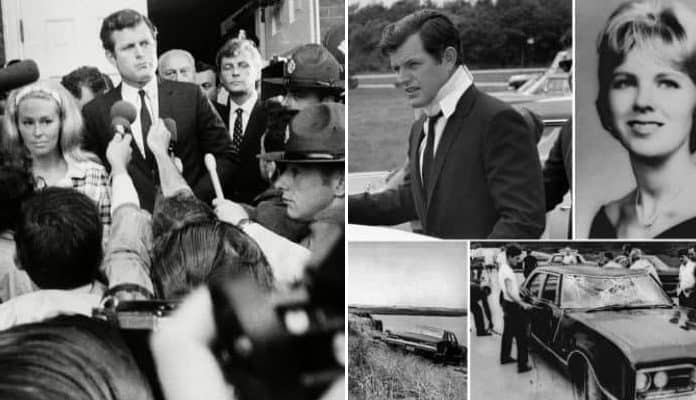 Senator Ted Kennedy, the youngest brother of assassinated president John F. Kennedy and slain presidential hopeful Robert F. Kennedy had his own eye on the presidency before the fatal Chappaquiddick incident on July 18, 1969. The episode saw Senator Kennedy drive his car off of a bridge into a pond. His passenger, a young campaign staffer, named Mary Jo Kopechne, was not able to free herself from the sinking car. Kennedy left her behind to go get help, bringing only two hand-chosen close friends. After they were unable to retrieve her, they left without ever notifying anyone else. Kopechne’s body was found the next day. Mary Jo Kopechne and Robert F. Kennedy. Photo by ANL/REX/Shutterstock/People. Due to Kennedy and his friends never notifying authorities about the accident, Kopechne’s body wasn’t found for hours. Locals discovered the car in the water the next day, July 19th, and alerted the police. Divers found Kopechne’s body on the morning of the 19th. According to a firefighter on the scene, who helped recover the body, Kopechne was positioned in a way that indicated she had an air bubble and was fighting to live as the car was slowly submerged. Others have argued that the water would have been too cold to survive for long. Regardless of how long it took, what is undeniable is that Kopechne died under suspicious circumstances.